Is Raymond Davis a manufactured controversy? The latest conspiracy theory that has been spread thanks to a statement by a Lahore police official published in Express Tribune, is the wildest yet. According to the unnamed official, “The Lahore killings were a blessing in disguise for our security agencies who suspected that Davis was masterminding terrorist activities in Lahore and other parts of Punjab”. According to the official, cellphones recovered from Davis showed that he was in communication with militants from TTP and Lashkar-e-Jhangvi (LeJ). If having contact with militants means that you are ‘masterminding terrorist activities’, we are in serious trouble not because of CIA agents but because of our own intelligence agencies who surely have far more contact with militants than any CIA agent would dream. LeJ is a splinter of the group Sipah-e-Sahaba (SSP) which began as a Deobandi political party in the 1980s formed by Maulana Haq Nawaz Jhangvi to fight Shia influence after the Iranian revolution in 1979. In 1996, SSP members who thought the organization was not militant enough formed LeJ as the armed wing of the anti-Shia group. LeJ received arms and training from the Harkat-ul-Mujahideen (HuM) group involved in the Afghanistan jihad of the 1980s which was supported by the CIA and the ISI. And let’s consider what contacts our intelligence agencies had with Mr Raymond Davis before the incident. The latest statements from the ISI, though, suggest that they had no idea who he was or what he was doing. Even Pakistan’s spies say they had no idea what Davis was doing in Lahore. A senior intelligence source told The Daily Telegraph he was unknown to Pakistan’s Inter-Services Intelligence directorate and was operating outside the normal agreements between the two countries. “We want the US to come clean on what exactly he was up to,” he said. But earlier news reports said the two men shot by Davis were ISI spies who were trailing him. According to the Pakistani officials, the two men had been sent to track Raymond Davis by the Inter-Services Intelligence, or ISI, which believed that Davis had crossed “a red line” and needed to be followed. In late January, those officials say, Davis was asked to leave an area of Lahore restricted by the military. His cell phone was tracked, said one government official, and some of his calls were made to the Waziristan tribal areas, where the Pakistani Taliban and a dozen other militant groups have a safe haven. Pakistani intelligence officials saw him as a threat who was “encroaching on their turf,” the official said. According to the article by Declan Walsh, a senior ISI official denied that the two men were ISI agents and suggested that the whole matter was the result of ISI frustration with their CIA counterparts not keeping them in the loop. A senior ISI official denied the dead men worked for the spy agency but admitted the CIA relationship had been damaged. “We are a sovereign country and if they want to work with us, they need to develop a trusting relationship on the basis of equality. Being arrogant and demanding is not the way to do it,” he said. When Raymond Davis’s identity as CIA was revealed in the media, it was not because the US government felt it in their best interests to admit as much but because ISI agents exposed his identity. And what has caused this? Is this meant to put pressure on the CIA over the US lawsuit against ISI chief Pasha? Other questions that are being ignored include who are the two men that were shot by Raymond Davis? Were they simply in the wrong place at the wrong time, or were they intelligence operatives playing spy-vs-spy? Why were they carrying illegal guns? 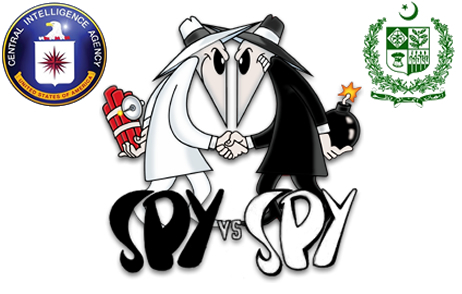 Once you cancel out all the noise and conspiracy theories, it looks more and more like a spy-vs-spy game played between the ISI and the CIA. It is not known who the winner will be, but the loser is sure to be regular Pakistanis. This entry was posted in Blogs and tagged CIA, conspriacy theories, intelligence agencies, isi, Raymond Davis by Mahmood Adeel. Bookmark the permalink.